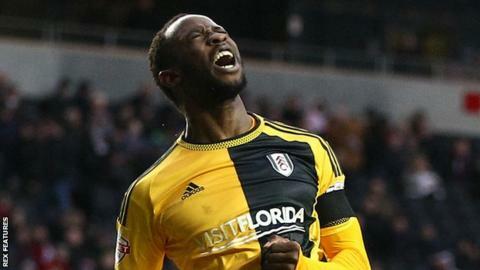 Moussa Dembele struck a first-half equaliser to give managerless Fulham a point against struggling MK Dons. The hosts led when Josh Murphy crossed to Dean Bowditch, who drilled in a half-volleyed effort from long range. Fulham restored parity on the stroke of half-time when Dembele tapped home Ross McCormack's cross. McCormack came close to giving Fulham all three points with 10 minutes left but Diego Poyet reacted well to clear his effort off the line. Fulham, who were playing their first match since sacking Kit Symons, are winless in their last three league games while MK Dons slip back into the Championship relegation places. Dembele, the Football League's Young Player of the Month for October, could have given the visitors the lead on two occasions. But Dons keeper David Martin saved his header before Dembele then shot straight over the crossbar from just a yard out. After breaking the deadlock, home forward Bowditch nearly doubled their lead from Kyle McFadzean's cross but Luke Garbutt cleared. Fulham hit back and went into the break level through Dembele, but the Dons started the second half well and Nicky Maynard went close after linking up with Jordan Spence, but his effort went over the bar. McCormack almost stole all three points for the visitors late on when he fired McFadzean's clearance towards goal, but Poyet blocked his shot off the line. "We should have been 2-0 up in the first half but we had a moment when we switched off slightly and the lad's put it in - I think that's when football is unfair because we really should have been two clear. "The more and more we became open the more Fulham's better players got into the game, and they ended up winning the one-on-one battles. Our game plan went missing a bit in the second half but as soon as the fans got behind our players they got back in the game. "But I think if we keep these players fit and this group fit we're going to be okay come the end of the season. If we go down fighting it's all I can ask of them, my players are mentally and physically ready for the fight." "The first half was difficult, we started okay but I could see the flaws in the team that we have. We have a lot of good players in the team but we were giving the ball away too easily, but in the second half we had more control of the game and we started to cause a threat. "Moussa had a fantastic chance to give us the lead and that would have obviously changed the game, but I thought they dug in in the second half, but it's been a tough couple of weeks for them - I thought they showed great character. "We could have won it today but we could have lost it too, so overall I'm happy with the point to be honest. I was delighted to come back into the dugout, but I'm only here to come and fill the gap for the chairman while they search for a new manager. "We have to get the right man and hopefully he can take us to the Premier League." Match ends, MK Dons 1, Fulham 1. Second Half ends, MK Dons 1, Fulham 1. Corner, MK Dons. Conceded by Luke Garbutt. Attempt missed. Carl Baker (MK Dons) left footed shot from outside the box is just a bit too high. Assisted by Robert Hall. Attempt saved. Tom Cairney (Fulham) left footed shot from outside the box is saved in the centre of the goal. Assisted by Sean Kavanagh. Offside, Fulham. Sean Kavanagh tries a through ball, but Luke Garbutt is caught offside. Attempt blocked. Sean Kavanagh (Fulham) left footed shot from outside the box is blocked. Attempt blocked. Jamie O'Hara (Fulham) left footed shot from outside the box is blocked. Attempt blocked. Ross McCormack (Fulham) right footed shot from the centre of the box is blocked. Assisted by Tom Cairney. Attempt blocked. Jamie O'Hara (Fulham) left footed shot from outside the box is blocked. Assisted by Ross McCormack. Attempt missed. Luke Garbutt (Fulham) left footed shot from outside the box is high and wide to the left. Assisted by Tom Cairney. Offside, Fulham. Sakari Mattila tries a through ball, but Ross McCormack is caught offside. Attempt blocked. Jamie O'Hara (Fulham) left footed shot from the left side of the box is blocked. Assisted by Ross McCormack. Substitution, MK Dons. Robert Hall replaces Dean Bowditch. Substitution, Fulham. Sakari Mattila replaces Ryan Tunnicliffe because of an injury. Delay in match Ryan Tunnicliffe (Fulham) because of an injury. Ryan Tunnicliffe (Fulham) wins a free kick in the defensive half. Attempt missed. Nicky Maynard (MK Dons) right footed shot from the right side of the box is too high. Assisted by Jordan Spence. Attempt missed. Josh Murphy (MK Dons) left footed shot from outside the box misses to the right. Assisted by Diego Poyet.